"They took him out of the mosque and cut off his ears. They said, 'Anyone working for the government will be punished like this'," he said. Kabul, Afghanistan - Suspected Taliban militants "punished" a schoolteacher for working for the government by dragging him out of a mosque and cutting off his ears in Afghanistan. 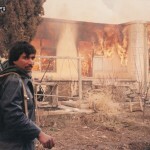 A school torched by Taliban in Khost. Zabul provincial education chief Mohammad Nabi Khushal said the armed rebels barged into the mosque while worshippers were at a late night prayer, and took another dozen people and beat them up on similar chargers. Khushal said the Taliban selected primary school teacher Bismillah Khan to punish him for the crime of working for the government. Khan was working as a primary school teacher at a refurbished school which reopened five months ago. He was rushed to a U.S. military-run hospital for treatment, reports said. 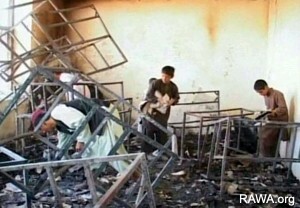 But a Taliban spokesman denies the group was responsible for the attack. Taliban spokesman Yousuf Ahmadi, said "Whoever they were, they were not our mujahideen [holy fighters]." Close to 28 percent of Afghan children, aged 5 to 11 years, has been forced to resort to child labor.